This spring, 25 chefs and staff from school and childcare center kitchens throughout Oregon participated in a culinary workshop at the Salem-Keizer School District’s Food and Nutrition Services facility. The group was split up into teams and tasked with producing a complete meal that met high standards for both taste and nutrition. Berdan gave each group a different recipe. For instance, Team 2 was given a mega-cheese muffin, and mushroom and beef tacos. Team 4 was assigned beef and broccoli rice bowls, and pear and farro salad. He gave a tour of the facility and basic instructions. Then he let them loose, giving them two hours to complete the meals for a lunchtime tasting. 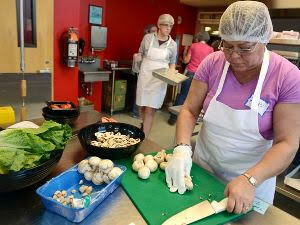 The five teams worked diligently in the crowded kitchen, chopping vegetables and mixing ingredients. The assigned recipes were enough to draw some participants out of their comfort zones. Some were also challenged with providing healthy choices, like using whole grains and seasonings other than sodium. Anne Goetze, Director of Nutrition Affairs for the Oregon Dairy Council, said, “For some I’d say it’s new, but not radically different. They’re just learning new skills. When Garrett plans this, he does it with the perspective that they can do it in their own school kitchens,” she said. Children, staff and families from West Haven Child Development Center in Connecticut implemented preschool garden project. The children read books about seeds, learned how plants grow and use fresh food from their garden. What’s Cooking? is a robust resource from the USDA with lots of healthy recipes for schools and families. You can create your own cookbook; includes recipes for large groups to help with menu planning.